I am such a bad blogger. I've been sick and having a hard time getting back in to the swing of things! Here is a lunch from last week! 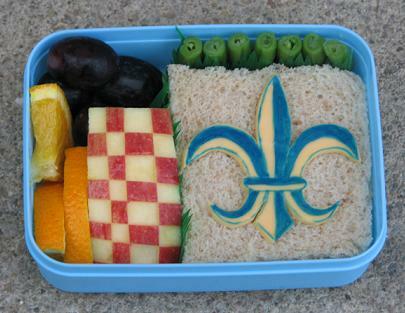 Kidlet started Cub Scouts again this past week so I made him a Fleur De Lis bento! Kidlet has a Fleur De Lis made of cheese and food color markers on top of a soy ham sandwich. Along the side are a checkered apple, grapes, orange slices, and green beans!